solidThinking Inspire allows design engineers, product designers, and architects to generate and investigate structurally efficient concepts quickly and easily. Traditional structural simulations allow engineers to check if a design will support the required loads. Inspire assists you by creating new geometry within your package space using the loads as an input. Inspire is easy to learn and works with your existing tools to help you design structural parts right the first time, reducing development time, material consumption, and product weight. solidThinking Evolve is the Ultimate Hybrid Modeling and Rendering system that allows designers to develop forms faster, using either Windows or OSX. Evolve captures an initial sketch, then allows you to explore styling alternatives and visualize your products with high quality renderings generated in real time. It combines Surface, Solid, and Polygonal modeling all with the control of a unique ConstructionTree history feature. 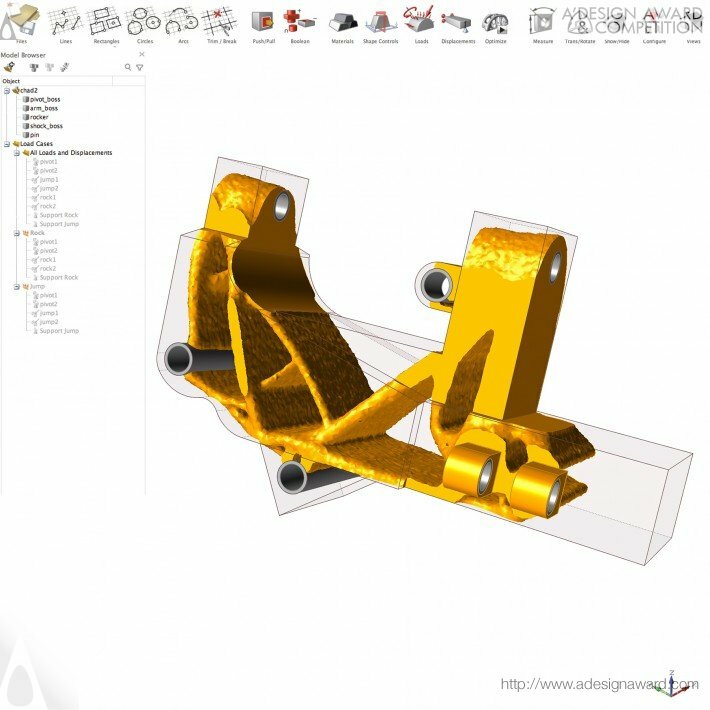 Evolve releases designers from the constraints of engineering oriented CAD tools, while allowing the export of digital models required by others in the product development process. SolidThinking Evolve® is the modeling module and brings high-level parametrically controlled Non Uniform Rational B-Spline (NURB) curve ability into play!. What this means is that you can accurately model and subsequently control complex surfaces at any time in the modelling process by adjusting the dimensional and constraint parameters of the model or by visual dragging of control points. This is probably the best Mac based modeling tool for accurate creation of curvaceous and mechanical forms and is particularly useful in product design, jewellery design and curvaceous architectural building design. Model files from SolidThinking can be output to regular CAD programs for the creation of 2D documentation. In the same family of products also exists SolidThinking Inspire that takes models and applies optimization algorithms to create lighter, stronger, more rigid or more flexible shapes to the design. SolidThinking is sold via channel partners of Altair.